Welcome to my Wednesday feature about what we are doing in the lab! I will just tell you that when my kids come in and see those blue dish pans out they start cheering because they know it is Boat Day! Yes, even those sophisticated fifth graders love boats. Those are just a few created last spring. Okay, here's the back story. 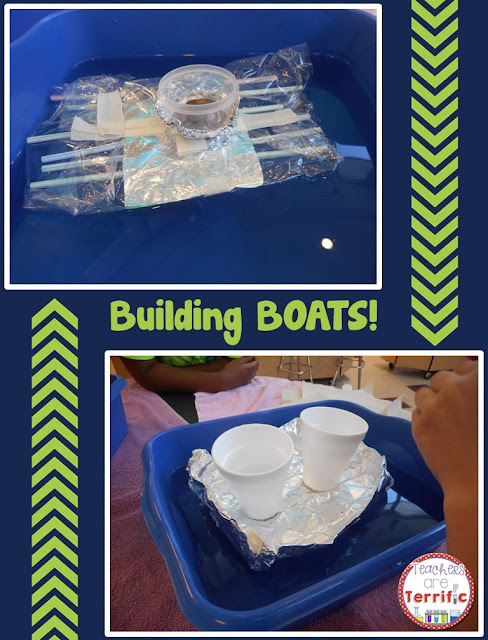 I saw a photo or a pin or something about building boats using just one supply. Okay, I thought, that would be easy, but what if I just added some extra things to see how the kids will combine items or use wacky things for the boat. Really. This was not a Brain Pop moment for me. All I truly did was go through all my supply cabinets and pull out things that might be used. 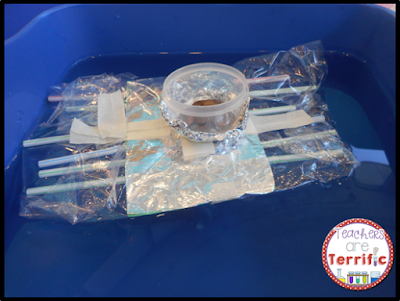 I decided to make the supplies have a cost and the kids would have to work on a budget. Now, I did this for several reasons. First of all, I know what kids do when you put out a vast array of supplies. They pick some of everything and then try it all. Secondly, they think the endless supply is just that- ENDLESS! So, when something is ruined they just want more. Well, a school teacher's budget does not lend itself well to SEVEN classes using twenty zillion straws and cups, so I settled on prices for everything, gave the kids a cost list, a planning sheet, and we got busy building boats. 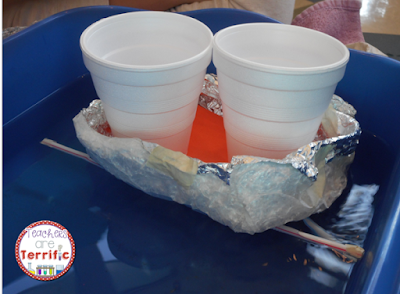 The most exciting part of this challenge is, of course, testing the boats! The kids all gather around as we start placing weights in the container on the boat. They count out loud and moan when the boat starts taking on water. We keep a list on our board of the highest number of pennies in each class and it is quite competitive. It's a fabulous challenge- every kids loves it! The pins on Pinterest of this challenge have been re-pinned almost more than anything else I have ever posted, and it remains the best seller for my little TpT store. 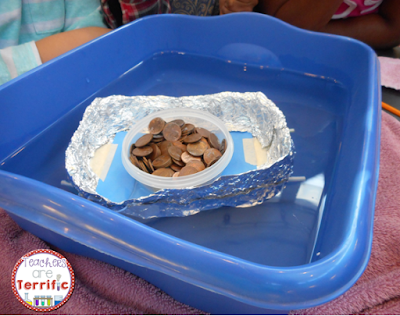 It's a task with a budget, easy supplies, easy prep, not so hard clean up, total engagement, and 100% fun! 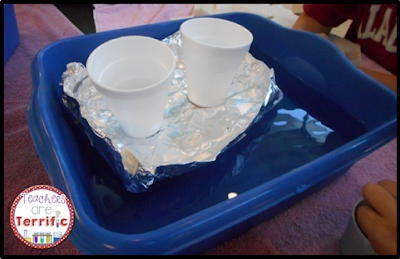 So, that's what's going on in Science class this week- just a little boat floating (or sinking) and a lot of water and a lot of paper towels. I love the idea of placing a cost on the materials. Do you have more information on this? Hi Shantel! Thanks for visiting. It's a simple process- I made each building item have a price and the kids have a cost planning sheet. They bring their shopping list to get supplies and build. You can see this product at my Teachers Pay Teachers store. If you go to the main page it's the first product listed! Thanks for your interest!